Summer hit our little family in full force. My husband is taking summer classes and working two jobs, and most days it is just me and the kids. We have many fun staycation events planned- from park visits to library programs- but the days can sometimes get long. Between activities, sibling fights, housework, and grocery runs, I sometimes loose sight of the minutes that have the opportunity to be summer MOMents (MOM-moments!). The other day I took a step back, breathed in deeply, and looked at every day in a new light. Since then, the kids and I have been discovering ways to turn ordinary days into summer time memories. #1 Take regular ol’ toys and games to a new location. As I write this, the boys are currently playing cars outside on the back deck. They play cars everyday, but there’s something about playing them outdoors in a different location that they find so much more fun! I’ve found that this goes with any toy or activity. We take puzzles outside, move snack time to the front porch, and have reading time in the swing. I think “Unplug” may be the word of the year. Everywhere I turn, there are reminders for us to unplug from our electronic society and do something that doesn’t require a screen. 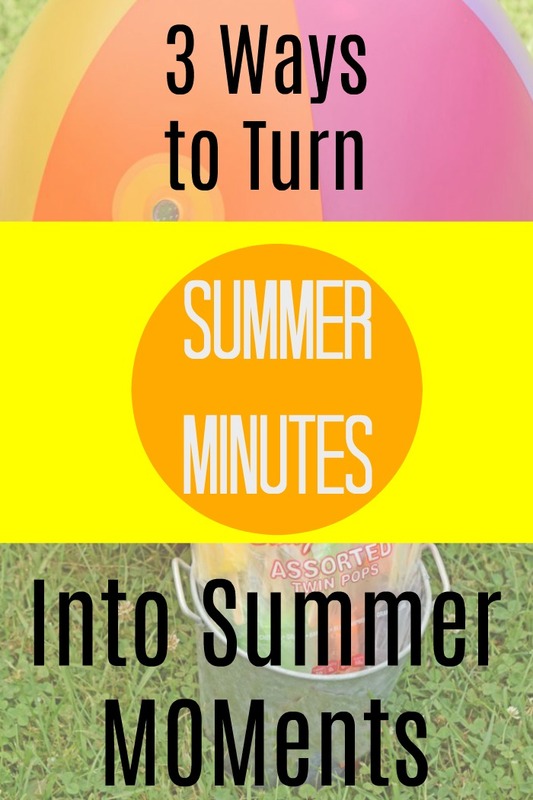 My boys love outdoors, and these activities make summer memorable. When I think of summers past, I remember the boys splashing in the kiddie pool and playing in the sand box with friends. Creating summer MOMents can be as easy as stepping out the front door. #3 Turn small things into celebrations. I’ve learned that every kid loves a good party. But what a “party” is to a kid is also not what a “party” is to an adult. I can blow up a few balloons, give my kids a cupcake, and they call it a party. 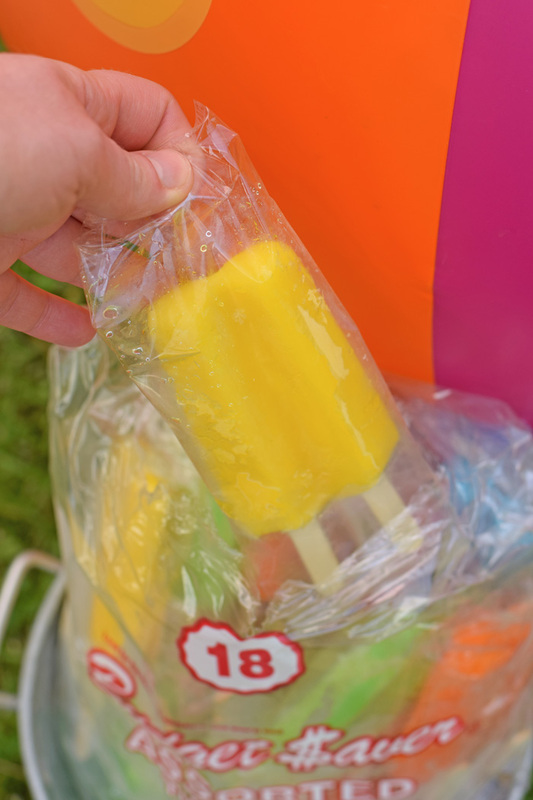 By pulling out a few decorations and a bag of Budget Saver Twin Pops, we have a Pop-Up Popsicle Stand! After playing with water balloons and in the sprinkler, the kids like to cool off with a popsicle. 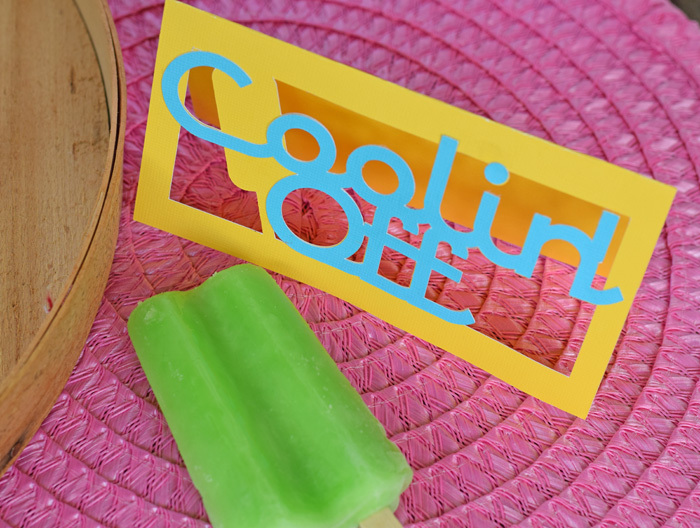 While they play, I grab a small stand, a colorful garland, an aluminum bucket with ice, and a popsicle “Coolin’ Off” sign to make a quick Popsicle Stand. If you do not have these items, you can substitute with anything bright and summer-y! 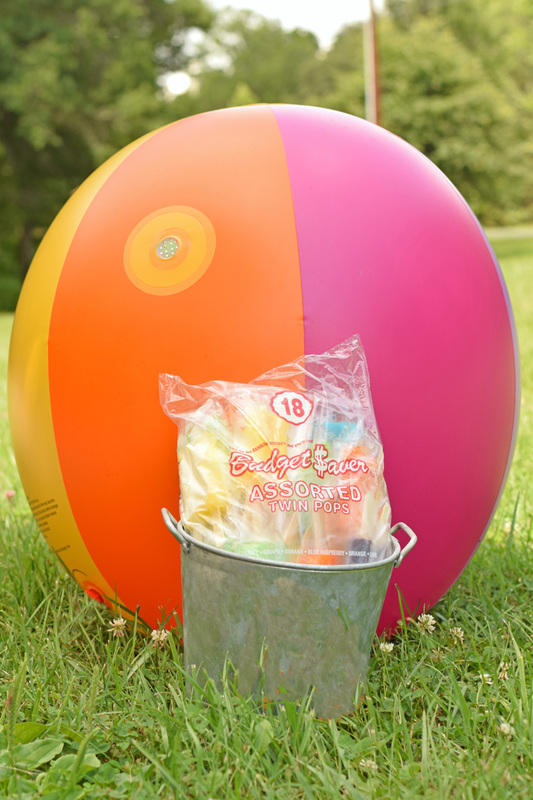 Balloons, colorful card stock, and a neon plastic bin with ice are great for an easy Pop-up Popsicle stand, too! These are sweet MOMents. They flop down on beach towels in the front yard and giggle as they recount the day’s adventures. I appreciate the stories behind businesses, and Budget Saver Twin Pops have a historical one. During the Great Depression, the Twin Pop was invented so that one nickel would purchase a Twin Pop. Two children could then split the Twin Pop and each have a treat. In 1989, the Budget Saver assorted six flavor Rainbow Array bag was born. How do you turn situations into MOMents? Budget Saver wants moms to show them their sweet MOMents for a chance to win a grand prize. Budget Saver Twin Pops can turn a stressful situation into a MOMent. To enter to win, use #twinpopscontest on Twitter or Instagram to show how you make every moment sweet with Budget Saver Twin Pops. Your entry could be selected as a weekly or even the Grand Prize Winning MOMent! Follow along with Budget Saver on Facebook for updates. The Popsicles on the outside of the bucket is so cute! This is a great idea for kids of any age! These are a favorite for our house in the summertime. We keep in them in our freezer to enjoy after a day out in the sun with the kids. Great for parties too. WE usually do these instead of ice cream. YUM! THanks for the great ideas for making memories! 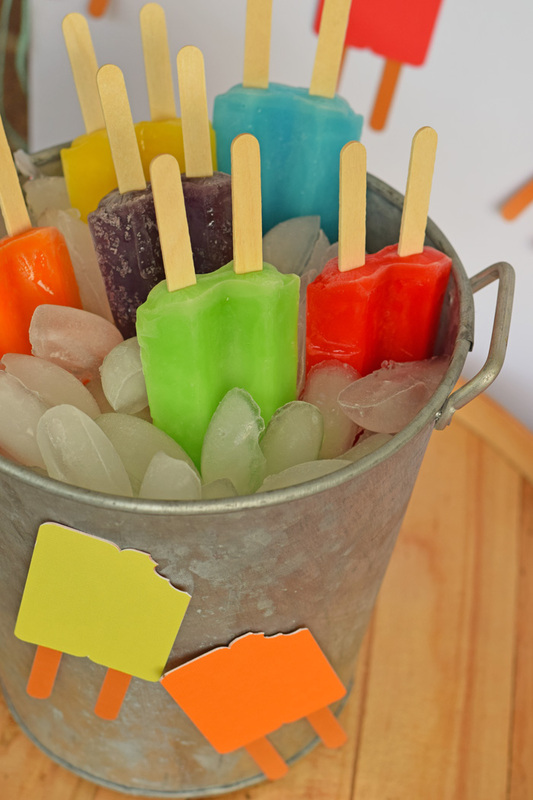 What a cute idea with the pop up popsicle stand. When my kids were little I remember doing all those fun things to keep them busy. This is a great summer idea! We are having a party for my granddaughter in Aug, I am going to make her a pop up popsicle stand! This is so cool. My daughter would love having something like this. And it would be awesome to have something like that for the summer. Just being able to have those popsicles at the ready in those hot days that we have out here. This is a pretty smart idea to do with the Popsicles for summer get togethers with friends this summer. My kids are huge fans of these kind of pops as well, so that within itself is already a win. We used to do a stand at the end of our yard when we were younger, I am not even sure you’re allowed to do it these days without permission from the county. Summer is definitely in full swing here as well. They are playing outside as often as possible and I am trying to sleep in as often as possible, with little success. 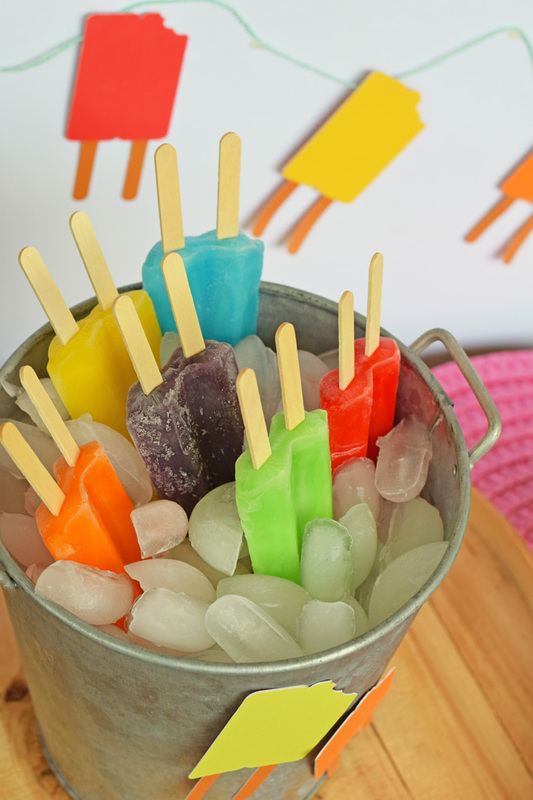 I absolutely love your summer fun ideas and the popsicle stand is such a fun way to make an ordinary treat extraordinary! 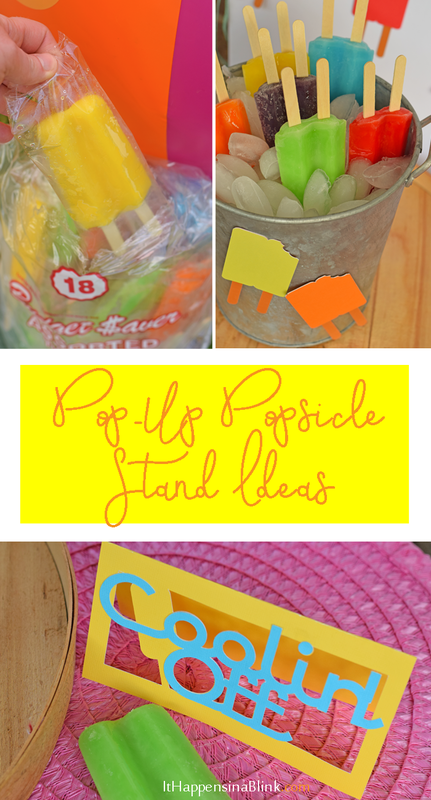 I just love this idea and my daughter loves popsicles! I know we will do something similar to this when she gets a little older. We would probably do this at my in-law’s house because we live off of a main road and cars can go really fast, but what an awesome idea! Love the colors. What a cute idea. But I am afraid that it wouldn’t last long in our NC summer weather.